Provided by the publisher through NetGalley. All opinions are my own. One of the things that I absolutely love about being a multicultural family is getting to celebrate lots of occasions from a number of different cultures. We celebrate Japanese bean-throwing day and White Day and Obon, but French-Canadian Reveillon on one day and turkey day the next. We are gradually trying to push trick-or-treating into our neighbourhood. I even have a Schultüte planned for my son's first day of school in April. Of course today is Thanksgiving and that is an important holiday on our calendar. We had a lot to be thankful for today, I hope you do too. Cultural celebrations are not only good fun and a chance to socialize (and eat!) but a great way to learn about geography, history, languages and so much more - even math if you are cooking or checking out the calendar! Lighting Our World takes a Gregorian calendar year and goes through a number of holidays which use lights to celebrate, all over the world. 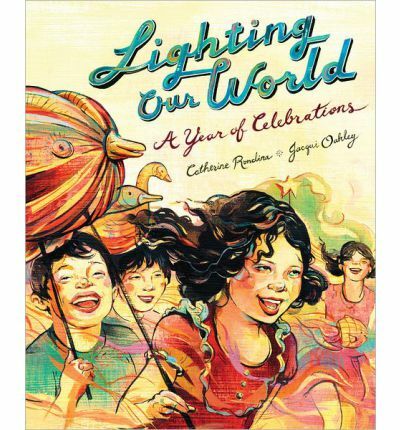 Every single one of the subjects above is covered, and the author uses children to introduce their own celebration which is very accessible to the middle grade reader. Some of the celebrations, like Independence Day or Canada Day are based around countries, but most are for cultures, whether over a number of countries (like Easter or Ramadan) or a cultural group within a nation, like Kwanzaa. I was familiar with just about three-quarters of the celebrations contained herein. Holidays like Enkutatash in Ethiopia and Inti Raymi in Peru were new to me. We got out our globe and had fun picking out which celebration was celebrated where. It's great that the book is set up so that different variations on a similar theme are close together so kids can see how things change from group to group. My kids and I are very familiar with the August celebration of Obon in Japan, but it was the firsttime we heard about the Chinese (probably original!) version called Chung Yuan. What I personally liked best about this book is it is truly international. So many books introducing cultural concepts set it up as how they are different from us. But this one is set up so there is no standard, so even Halloween or other holiday likely to be celebrated by the North American audience are described as just one of many different celebrations. This is the kind of book that would do great in ELT classrooms around the world. Jacqui Oakley has somehow captured the hues of bright festival colours tempered by twilight or a flickering lantern. Her illustrations are infused with the joy of children experiencing the best of their culture. I can't imagine how much she had to research to get all of the costumes, lanterns, and architecture correct, but the work she put in was well worth it because the product is gorgeous. This review is a part of Nonfiction Monday, hosted this week by Wendie's Wanderings. Sounds like this would make a nice addition to our personal library. I think it would. It's gorgeous! Hi! Great idea for a book, and of course now I want to learn more about Enkutatash in Ethiopia and Inti Raymi in Peru. I agree - the international focus of this book sounds great. Me too! The problem with this book is how much I want to travel to all these places around the globe now! I think that it would work best for upper elementary, but if the US curriculum is anything like the Canadian one, I think it would fit with the junior high curriculum of introducing different countries. But my kindergarteners enjoyed it as a read-aloud too! Happy Thanksgiving! Hope you had our portion of turkey (just can't bring myself to cook one when it's 31C!). It's only a matter of time until the aliens come, probably following the wafting smell of turkey and butter tarts. So many wonderful celebrations and cultures to explore in this one..thanks for sharing!